Scottish architect Robert Adam became one of the most successful and fashionable architects in the 18th century in England. He was the leader of the Neo-Classical movement, also known as Adam Style. He influenced western architecture in Europe and North America. He did not just design buildings and homes, but accessories and furniture. I am particularly fond of his surface decorations within his rooms. 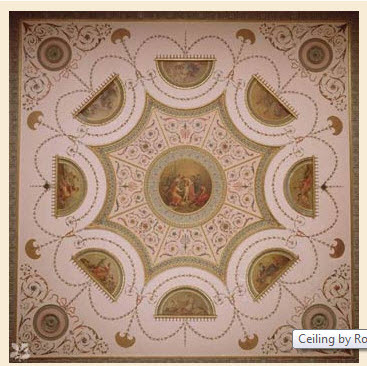 Above is an example of one of his ceilings. 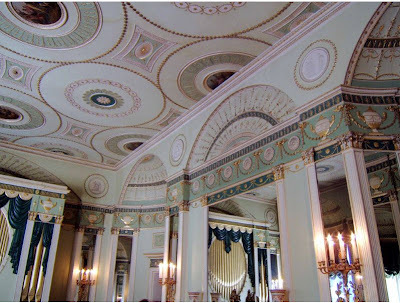 the paintings were subcontracted, painted on canvas and applied to the ceiling later. the curly foliage you see is taken from antiquity and is known as "Grotesque Design". Taken from the Italian word, "grotto" which is a subterranean garden. Above is another example of an Adam ceiling. also, the use of unusual colors like pale greens, blues and even pinks became his signature. He would provide a set of plans to be purchased by the owner and various artists and artisans would execute the designs using elaborate mouldings. 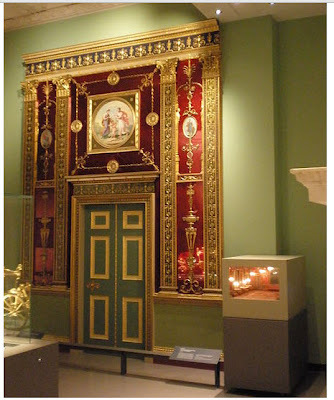 above is an example of a wall and doorway using colored glass panels, gilding, and painted mouldings. 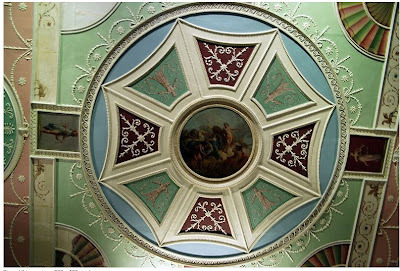 Here is an example of how the design of the arch of the doorway is repeated as a surface decoration on the ceiling creating continuity of design as well as the "movement" for which he is known. Neo-Classic or Classic Revival are all terms used to describe design vernacular from the Greco/Roman culture circa 5th century. The revival came after two cities in southern Italy were discovered by accident while digging a tunnel. These cities were Pompeii and Herculaneum. They were buried under volcanic ash and revealed all kinds of frescoes, architecture and art that were reproduced through an 18th c filter. 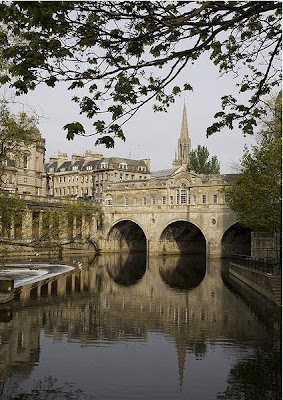 This is one of his most well known exterior structures in Bath, England called the Pulteney bridge. To view older posts, please go to my main page www.merlehillaryinteriors.blogspot.com.